Continuing to help fleets and independent drivers cut costs, Yokohama has launched an all-new, fuel-efficient long-haul drive tire: the TY577 MC2™. Now available in the U.S., the SmartWay-verified TY577 MC2 comes in sizes 295/75R22.5, 11R22.5, 285/75R24.5 and 11R24.5, and is also offered in 16-ply construction. 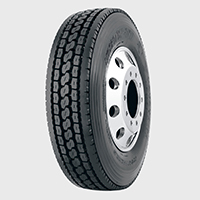 Clauer said the TY577 MC2 combines an ultra-deep tread pattern with Yokohama’s MC2 technology, which minimizes the effects of heat on the casing and tread, providing extreme low rolling resistance to reduce fleets’ cost-per-mile. -- Exceptionally long treadlife is achieved by a 30/32-inch deep groove depth that delivers a firm and stable road grip while maximizing run-out mileage, plus, the closed shoulder rib enables more rubber-to-road contact for long, even wear. Also: the stress wear control groove redistributes more load to the outside rib, greatly reducing the chance of shoulder step-down wear. -- Ultimate case durability is insured thanks to Yokohama’s STEM-2 technology, which redirects destructive casing flex. This leads to improved casing durability and retreadability. Additionally, the funnel-shaped groove reduces stone retention and increases block rigidity for improved traction and wear rate. More details on the TY577 MC2 at www.Yokohamatruck.com. Yokohama Tire Corporation is the North American manufacturing and marketing arm of Tokyo, Japan-based The Yokohama Rubber Co., Ltd., a global manufacturing and sales company of premium tires that’s celebrating its 100th anniversary in 2017. Servicing an extensive sales network throughout the U.S., Yokohama Tire Corporation is a leader in technology and innovation. The company’s complete product line includes tires for high-performance, light truck, passenger car, commercial truck and bus, and off-the-road mining and construction applications. For more information on Yokohama’s broad product line, visitwww.yokohamatire.com. Yokohama is a strong supporter of the tire care and safety guidelines established by the U.S. Tire Manufacturers Association and the National Highway Transportation and Safety Administration. Details can be found at the “Tire Care & Safety” section atwww.yokohamatire.com.